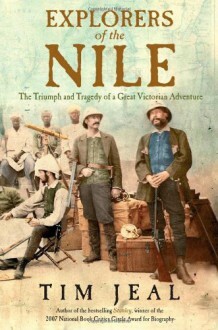 Nothing obsessed explorers of the mid-nineteenth century more than the quest to discover the source of the White Nile. It was the planet's most elusive secret, the prize coveted above all others. Between 1856 and 1876, six larger-than-life men and one extraordinary woman accepted the challenge. Showing extreme courage and resilience, Richard Burton, John Hanning Speke, James Augustus Grant, Samuel Baker, Florence von Sass, David Livingstone, and Henry Morton Stanley risked their lives and reputations in the fierce competition. Award-winning author Tim Jeal deploys fascinating new research to provide a vivid tableau of the unmapped "Dark Continent," its jungle deprivations, and the courage—as well as malicious tactics—of the explorers.On multiple forays launched into east and central Africa, the travelers passed through almost impenetrable terrain and suffered the ravages of flesh-eating ulcers, paralysis, malaria, deep spear wounds, and even death. They discovered Lakes Tanganyika and Victoria and became the first white people to encounter the kingdoms of Buganda and Bunyoro. Jeal weaves the story with authentic new detail and examines the tragic unintended legacy of the Nile search that still casts a long shadow over the people of Uganda and Sudan. There isn’t much new here in terms of Stanley and Livingston. The focus, however, is on the effects of such exploration as well as the disagreements that resulted among the explorers. The narrator’s voice does grow on you some what. What an extraordinary bunch of people - fascinating to know what drove them on.